LAUNCHING his party’s Lok Sabha poll campaign in three States, Prime Minister Narendra Modi on Thursday kept the focus on national security, terrorism and how his “decisive” Government showed the courage to conduct a surgical strike in all spheres -- land, sky and space. 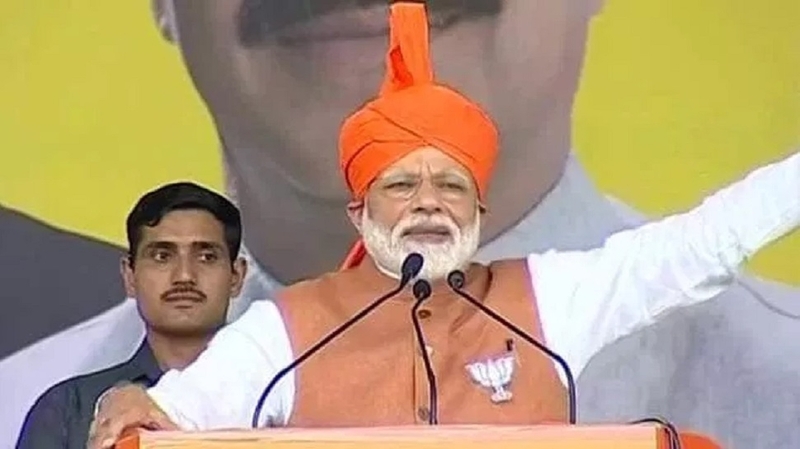 Modi addressed rallies in Meerut in Uttar Pradesh, Rudrapur in Uttarakhand and Akhnoor in Jammu and Kashmir--all part of Lok Sabha constituencies figuring in the first phase of the polls on April 11. Modi also tore into the opposition parties by coining an acronym ‘SARAB (alcohol’) from the initial letters of the Samajwadi Party(SP), Rashtriya Lok Dal(RLD) and Bahujan Samaj Party(BSP) alliance and urged people to “stay away from ‘SARAB’ in the polls for the good health of Uttar Pradesh.” The Hindi word for liquor is ‘sharab’. The country is, for the first time, witnessing a Government that knows how to deliver, he said. The Prime Minister, who launched the BJP’s campaign from Meerut in 2014 too, said he will bring justice to all. The contest this time will be between “dumdaar BJP and daagdaar Opposition”, he said, driving home his point that his party is strong but Opposition parties are tainted. In his third rally of the day at Akhnoor in Jammu region near the Indo-Pak border, Modi said terrorists across the border are living in a State of fear. In an apparent reference to the Balakot air strikes, Modi said those running the terrorist factory across the border are living under constant fear and the terrorists have been forced to think 100 times before sneaking into this side. “Those running the terrorist factory across the border are afraid and are living under constant fear. This had happened for the first time that the terrorists are forced to think 100 times to intrude into this side to rattle India,” Modi said at his first poll rally in J&K.